I saw this impression of our Milky Way recently and it made me think about something often thought casually about before — the size of the universe! I always tend to think about our own area of space as being comparatively small in the grandness of everything. The Milky Way itself is, after all, just another star to anyone looking from another galaxy and it appears so faint to us in the night sky that we can hardly see it without special equipment. However, seeing that impression of what the thing actually looks like stirred me a little, so I tried finding out just what the facts were regarding sizes, etc. and most of it stunned me! 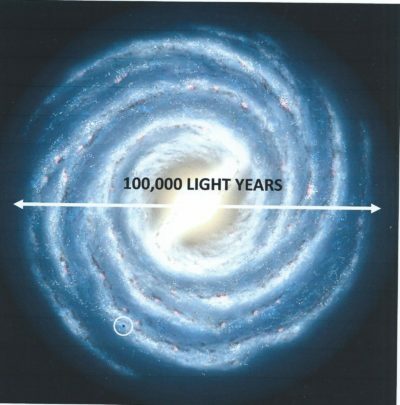 The first bit of information I gleaned was that the Milky Way is approximately 100,000 light years across, from side to side; that’s light travelling at 300,000 kilometers per second for 100,000 years. A bloody long way! Next I found that the first radio waves transmitted by man (in Morse code, I believe), were sent into the ether approximately 100 years ago, that is to say 100 light years ago. Based on the scale of the Milky Way illustration I had, I worked out that the first signal, theoretically still in existence, would have travelled from the centre to the edge of the tiny blue circle I have drawn at the lower left of the diagram. Note that I am referring to the blue circle, not the white ring surrounding it. Not very far, is it? If it’s taken 100 years for our first radio signals to get that far, just think how long any other signals would take to reach us, why, even signals sent from the other side of our own galaxy would take 100,000 years to reach us! While looking up all these dazzling figures, I came across a few others to blow the mind too. For instance, I read in one learned piece that if you were to scale down the distance from the Earth to the Sun to 0.3 of a meter, the nearest star to us would be 4.25km away (and it takes our most modern rockets nearly a year to get just as far as Mars). Somehow I have serious doubts regarding UFOs after reading information like this — as far as I can judge it would take them several lifetimes to get here, then they spend five minutes having a look at us, then they pop off back home again. Unbelievable! I love looking up or working out all these weird measurements occasionally, especially the ones concerned with the dimensions of space, whose distances are far too enormous to grasp in their actual sizes, but at least by scaling them down like this, it’s easier to understand the various relationships, size-wise! What I find this sort of exercise does, is to cut me down to size too, so that I appreciate just how important (or rather, unimportant), we are in the scheme of things. In the vastness of space, with the trillions and trillions of stars it must contain, some of them billions of light years away, many of them with habitable planets orbiting them, I find it impossible to believe there is only one small planet with intelligent life on it — that just doesn’t make sense to me. I guess we will never know, not in my lifetime anyway! Have you considered the significance of human life in the universe? Do you feel there is other life out there?